The conventional method of revitalization procedure was done by inducing bleeding into the pulp canal by mechanically irritating the periapical tissues. In necrotic teeth with open apices, some amount of pulp tissue along with Hertwigs Epithelial Root Sheath may survive apically and these tissues can proliferate once the inflammatory condition are reversed and the canal becomes totally disinfected. The created blood clot acts as a matrix for the in growth of new tissues into the pulp canal. However, this procedure will cause discomfort for the patient while mechanically irritating the periapical tissues. In the past two decades, an increased understanding of the physiological roles of platelets in wound healing and after tissue injury has led to the idea of using platelets as therapeutic tools. Platelet-Rich Plasma (PRP) consists of a limited volume of plasma enriched with platelets, which is obtained from the patient. The use of PRP as a potentially ideal scaffold for regenerative endodontic therapy has been documented in the literature. However, the use of bovine thrombin for the activation of Platelet Rich Plasma (PRP) has been an issue of controversy which led to the development of the second generation Platelet concentrate known as Choukroun's Platelet Rich Fibrin (PRF) which is totally autologous in nature. , . PRF was developed in France by Choukroun et al, in 2001. This technique is very simple and inexpensive. PRF contains platelets, growth factors, and cytokines that might enhance the healing potential of both soft and hard tissues. Literature survey reveals that there is an absence of documentation regarding the application of PRF in the field of regenerative endodontics. The purpose of this case report is to add a regenerative endodontic case to the existing literature about using PRF. A 9-year-old boy came with the chief complaint of broken upper front tooth (#8) along with discoloration [Figure 1]a. past dental history revealed trauma to his upper front tooth (#8). The medical history of the patient was non-contributory. Intraoral examination of his teeth revealed the presence of discolored tooth #8 along with Ellis class IV fracture. Tooth #8 was sensitive to both percussion and periapical palpation tests. It did not respond to CO 2 ice and electric pulp test (EPT). 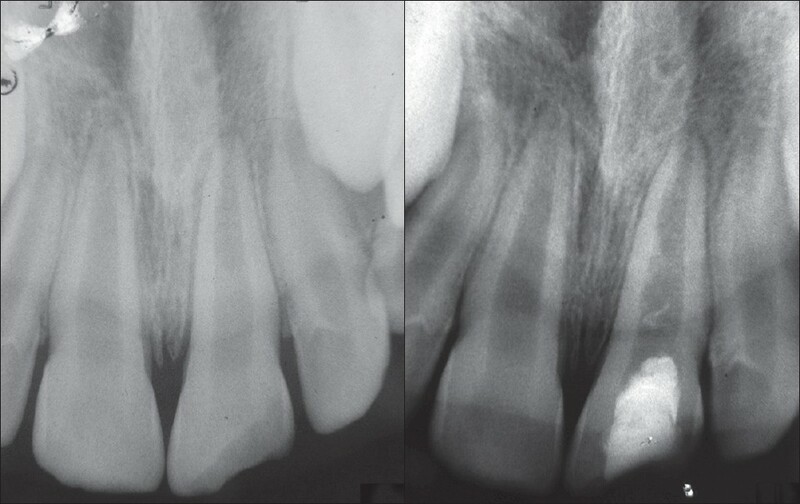 Periodontal probing depth of the tooth #8 was within normal limit. Intraoral Periapical Radiographic examination of tooth #8 revealed an immature root and an open apex associated with periapical radiolucency [Figure 2]a. Further radiographic examination of the tooth revealed a 3 mm open apex along with thin dentinal walls that appeared prone to fracture. So a clinical decision of performing a regenerative endodontic treatment using Choukroun's Platelet Rich Fibrin was decided. A written informed consent was obtained from the patient's mother. Local anesthesia was achieved using Lignocaine (1:100000 adrenaline, DJ Lab, India). After the rubber dam application, access cavity preparation was done on the tooth #8. The canal was thoroughly irrigated with 20 ml of 5.25% sodium hypochlorite solution (Novo Dental Product, India) and nuetralised with saline. Following this, irrigation was done using 10ml of hexidine solution (0.2% Chlorhexidine, Vishal Dentocare, India) and dried with paper points (Dentsply Maillefer Ballaigues). A mixture of Ciprofloxacin (Cifran 500mg, Ranbaxy Lab, India), Metronidazole (Metrogyl 400mg, J.B.Chemicals and Pharmaceuticals, India), and Minocycline paste (Minoz 50 mg, Ranbaxy Lab, India) was prepared into a creamy consistency and introduced into the canal using a lentulospiral. A cotton pellet was placed and the cavity was temporarily sealed with cavit (Dental Products of India, India). The patient returned after 21 days to the clinic and was asymptomatic. Local anesthesia was given, followed by rubber dam isolation; then the access cavity was reopened and thoroughly irrigated with sterile saline solution and dried with paper points. A 12ml sample of whole blood was drawn intravenously from the patient's right antecubital vein and centrifuged (REMI Model R-8c with 12×15ml swing out head) under 3000 rpm for 10 minutes to obtain the PRF which was jelly like in consistency. The PRF was condensed into the canal using a finger plugger (Dentsply Maillefer Ballaigues) till the level the cementoenamel junction. Grey MTA (ProRoot MTA; Dentsply) was placed directly over the PRF to a thickness of 3mm followed by a wet cotton pellet and cavit. The patient was recalled after 3 days and the setting of MTA was confirmed. 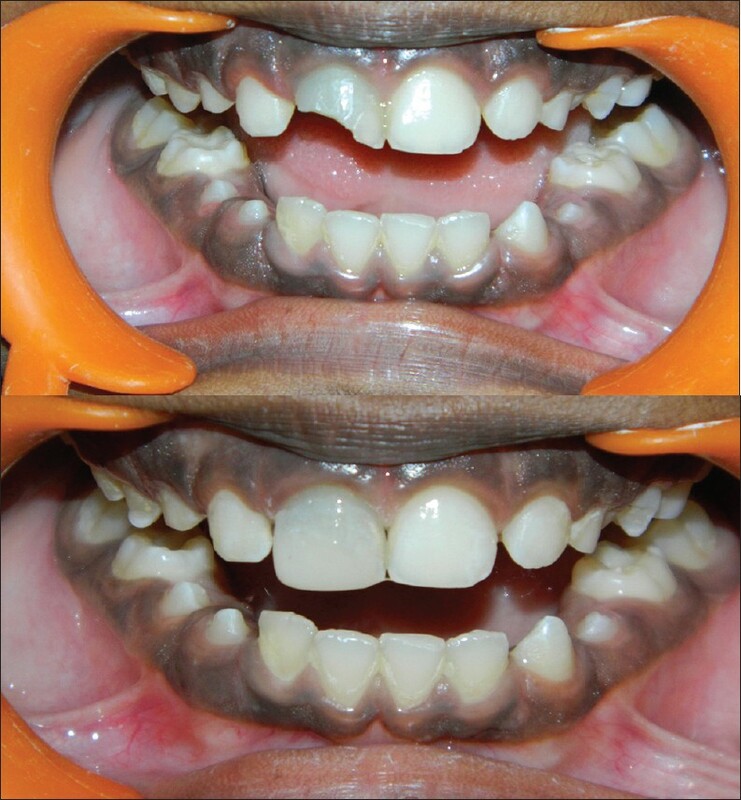 The access cavity was then double sealed with GIC and Composite restoration [Figure 1]b. The patient returned to the clinic after 3 months, 6 months, 9 months and 1 year for review and was asymptomatic; the tooth #8 showed negative response to percussion and palpation tests and responded positive to CO2 ice or an electric pulp tester (EPT). Radiograph revealed continued thickening of the dentinal walls, root lengthening, regression of the periapical lesion and apical closure [Figure 2]b. The patient is still under review. The potential theory behind the success of the presented case could be attributed to a study conducted by Huang et al, who concluded that the PRF causes proliferation of human Dental Pulp Cells and increases the protein expression of osteoprotegerin (OPG) and alkaline phosphatase (ALP) activity. Some amounts of human dental pulp cells present in the apical papilla usually remain vital even in case of a large periapical lesion. After the regression of the inflammation and under the influence of Hertwigs Epithelial Root Sheath these Dental Pulp Cells differentiate into odontoblasts like cells. , OPG and ALP expression are generally regarded as markers of odontoblastic differentiation. As there was no bleeding in the root canal before placing the PRF we conclude that whatever tissue was produced in the canal could be attributed to the presence of PRF. On the basis of the results obtained in our case report we conclude that revitalization of necrotic infected immature tooth is possible under conditions of total canal disinfection and PRF is an ideal biomaterial for pulp-dentin complex regeneration. The only disadvantage we faced with PRF was its manipulation to place inside the canal. Clinical trials are necessary to compare the effect of PRP, PRF and Induced bleeding in the revitalization of tooth with necrotic pulp and open apex on a long term basis. 1. Murray PE, Garcia-Godoy F, Hargreaves KM. Regenerative endodontics: A review of current status and a call for action. J Endod 2007;33:377-90. 3. Banchs F, Trope M. Revascularization of immature permanent teeth with apical periodontitis: New treatment protocol? J Endod 2004;30:196-200. 4. Ritter AL, Ritter AV, Murrah V, Sigurdsson A, Trope M. Pulp revascularization of replanted immature dog teeth after treatment with minocycline and doxycycline assessed by laser Doppler flowmetry, radiography, and histology. Dent Traumatol 2004;20:75-84. 5. Chueh LH, Ho YC, Kuo, Lai WH, Chen YH, Chiang CP. Regenerative endodontic treatment for necrotic immature permanent teeth. J Endod 2009;35:160-4. 6. Chueh LH, Huang GT. Immature teeth with periradicular periodontitis or abscess undergoing apexogenesis: A paradigm shift. J Endod 2006;32:1205-13. 7. Iwaya SI, Ikawa M, Kubota M. Revascularization of an immature permanent tooth with apical periodontitis and sinus tract. Dent Traumatol 2001;17:185-7. 8. Thibodeau B, Trope M. Pulp revascularization of a necrotic infected immature permanent tooth: Case report and review of the literature. Pediatr Dent 2007;29:47-50. 9. Petrino JA. Revascularization of necrotic pulp of immature teeth with apical periodontitis. Northwest Dent 2007;86:33-5. 10. Cotti E, Mereu M, Lusso D. Regenerative treatment of an immature, traumatized tooth with apical periodontitis: Report of a case. J Endod 2008;34:611-6. 11. Shah N, Logani A, Bhaskar U, Aggarwal V. Efficacy of revascularization to induce apexification/apexogensis in infected, nonvital, immature teeth: A pilot clinical study. J Endod 2008;34:919-25. 12. Torabinejad M, Turman M. Revitalization of tooth with necrotic pulp and open apex by using platelet-rich plasma: A case report. J Endod 2011;37:265-8. 13. Dohan DM, Choukroun J, Diss A, Dohan SL, Dohan AJ, Mouhyi J, et al. Platelet-rich fibrin (PRF): A second-generation platelet concentrate. Part I: Technological concepts and evolution. Oral Surg Oral Med Oral Pathol Oral Radiol Endod 2006;101:e37-44. 14. Huang FM, Yang SF, Zhao JH, Chang YC. Platelet-rich fibrin increases proliferation and differentiation of human dental pulp cells. J Endod 2010;36:1628-32. 15. Intini G, Andreana S, Intini FE, Buhite RJ, Bobek LA. Calcium sulfate and platelet-rich plasma make a novel osteo inductive biomaterial for bone regeneration. J Transl Med 2007;5:13. 16. Cronstein BN. Bovine thrombin and systemic autoimmunity. Am J Pathol 2003;162:1389; author reply 1389-90. 17. Bomgaars L, Carberry K, Fraser C, West A, Teruya J. Development of factor V and thrombin inhibitors in children following bovine thrombin exposure during cardiac surgery: A report of three cases. Congenit Heart Dis 2010;5:303-8. 18. Sunitha Raja V, Munirathnam Naidu E. Platelet-rich fibrin: Evolution of a second-generation platelet concentrate. Indian J Dent Res 2008;19:42-6. 19. O'Connell SM. Safety issues associated with platelet-rich fibrin method. Oral Surg Oral Med Oral Pathol Oral Radiol Endod. 2007;103:587; author reply 587-93. 20. Dohan DM, Choukroun J, Diss A, Dohan SL, Dohan AJ, Mouhyi J, et al. Platelet-rich fibrin (PRF): A second-generation platelet concentrate. Part II: Platelet-related biologic features. Oral Surg Oral Med Oral Pathol Oral Radiol Endod 2006;101:e45-50. 21. Windley W 3rd, Teixeira F, Levin L, Sigurdsson A,Trope M. Disinfection of immature teeth with a triple antibiotic paste. J Endod 2005;31:439-43. 22. Torabinejad M, Parirokh M. Mineral trioxide aggregate: A comprehensive literature review--part II: Leakage and biocompatibility investigations. J Endod 2010;36:190-202. 23. Gancedo-Caravia L, Garcia-Barbero E. Influence of humidity and setting time on the push-out strength of mineral trioxide aggregate obturations. J Endod 2006;32:894-6. 24. Johns DA, Vidyanath S. Revitalization of tooth with necrotic pulp and open apex by using platelet-rich plasma: A case report. J Endod 2011;37:743; author reply 743-4. 25. Wang X, Thibodeau B, Trope M, Trope M, Lin LM, Huang GT. Histologic characterization of regenerated tissues in canal space after the revitalization/revascularization procedure of immature dog teeth with apical periodontitis. J Endod 2010;36:56-63. Naik, B. and Karunakar, P. and Jayadev, M. and Rahul Marshal, V.
Shivashankar, V. and Johns, D.A. and Vidyanath, S. and Sam, G.